This post was last modified: 03-15-2012, 07:11 PM by AceInfinity. I just added the attachment, I was waiting for my Virus scan to finish. You can assign your own BBcode to each of the 7 custom buttons, and give them your own icons as well. This post was last modified: 03-15-2012, 06:31 PM by AceInfinity. As it was messing up my code tags for the post itself, so I added those spaces on purpose. I got bored of this project quick though so i'll leave it as is. It works, and I don't really have a purpose for working on it much more than that lol. I was going to try to boost performance a bit, but I don't think it matters. Looks really cool pal. You recall IDB's colour picker control? Would deffinetely look great here if anybody can get their hands on it that is, pretty sure the link's dead on his website and other forums. (06-28-2012, 09:35 AM)ByteBlast Wrote: Looks really cool pal. 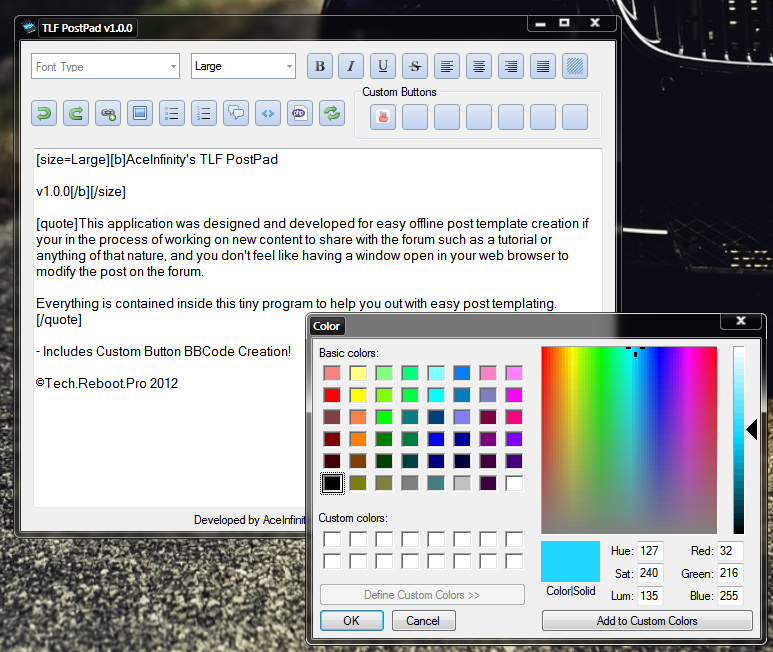 You recall IDB's colour picker control? Would deffinetely look great here if anybody can get their hands on it that is, pretty sure the link's dead on his website and other forums. Nope, not too sure on what you mean, I haven't really seen a lot of his stuff, I look at other people's projects and see what kind of stuff they are working on and all that, but for the most part I just make my own stuff, and use other's to instigate ideas to new projects of my own that I think up. This was more of a "Oh, I seen someone else make a tool like this for another forum, lets create my own version and see what kind of features I can come up with". Doesn't matter if it's useful or not, it's still good for the practice, and when you release it to others they get an idea of your coding style, and can learn, or make feedback for you. Well been away for a while again :/ Sorry guys, and i can see i have missed so much! Wow Ace, this is a really great project, I was thinking of making something similar earlier but never had time to make it.